Sente no gote is a Japanese go term that refers to a play that appears to be sente, but is really gote. It is normally bad play. This example comes from here. looks like sente, since it forces . However, after - Black has to come back and protect the corner with . is sente no gote. 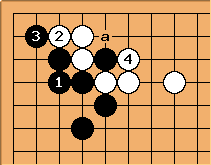 The correct move would be to play here instead, since it is (probably) sente, because it makes a Black move at a work. Some would call here gote no sente. The term 先中后 (xiān zhōng hòu) is often translated as sente no gote, and the example above qualifies as a 先中后. 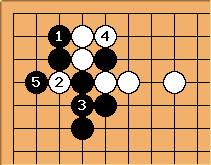 However, 先中后 actually describes a move that is sente for the moment, but leaves behind weaknesses or aji that require patching up later, so 先中后 has a usage broader than sente no gote.